Good launch price for the new Xaomi phone that was released on 24 July. This version lists the global band in the specification (B20) so should be good for all UK networks. The main selling point of this Xaomi model, apart from having the latest processor, is that it runs Android One, a clean, stock version of Android with no bloatware. It also means you can upgrade to the latest version of Android without waiting for the device manufacturer to release their own customised version. I'll post it here instead then!! No 3.5mm headphone jack, have to use type c port, but worst of all, if it's the same as 6x, no micro SD slot! I'll post it here instead then!! No 3.5mm headphone jack, have to use …I'll post it here instead then!! No 3.5mm headphone jack, have to use type c port, but worst of all, if it's the same as 6x, no micro SD slot! And don't forget how badly supported the A1 was. It has only just received 8.1, months after their other devices. Uh, the A2 is the global version of the 6X so you would expect it to be the same. And don't forget how badly supported the A1 was. It has only just received …And don't forget how badly supported the A1 was. It has only just received 8.1, months after their other devices. I didn’t know that. I thought the benefit of being Android One compatible is that you don’t have to wait for adaptations of the latest Android, you can just take the stock version from Google ? I have to agree that no headphone jack and no micro SD card make this seem like a step back from the A1, for me at least. I didn’t know that. I thought the benefit of being Android One compatible i …I didn’t know that. I thought the benefit of being Android One compatible is that you don’t have to wait for adaptations of the latest Android, you can just take the stock version from Google ? Yep that's correct, but they still messed it up and the phone still has some bugs. Hopefully now they have a few Android one devices, they will support them better. No SD card slot and inbuilt headphone socket will be a deal breaker for me. I was looking forward to this so a bit disappointed. Guess I'll look at something else. No SD card slot and inbuilt headphone socket will be a deal breaker for …No SD card slot and inbuilt headphone socket will be a deal breaker for me. I was looking forward to this so a bit disappointed. Guess I'll look at something else. Do you have a 7 plus? Tempted myself as just got an honor 9 and I don't like it. Was gonna buy a OP6 but I am too tight lol. There's a coupon for £5.99 off all £200+ orders: JBUY599. Do you have a 7 plus? Tempted myself as just got an honor 9 and I don't …Do you have a 7 plus? Tempted myself as just got an honor 9 and I don't like it. Was gonna buy a OP6 but I am too tight lol. I'm too indecisive, had a op6 which had a few issues so I returned it. Ordered the mate 10, but then cancelled that. Ordered the 7plus but then changed my mind after ordering. I'm too indecisive, had a op6 which had a few issues so I returned it. …I'm too indecisive, had a op6 which had a few issues so I returned it. Ordered the mate 10, but then cancelled that. Ordered the 7plus but then changed my mind after ordering. Lol sound like me. I orederd an essential ph1 other day and cancelled it. Even have cases on way for it lol. To be fair to Xiaomi the 8.1 update was produced a while ago, but they had to pull it because of problems. So it was produced in a reasonable time, they just didn't do it properly, and I would rather it works than a rushed version. You can forgive the headphone jack because you can use the type c, and the 3000mah battery as it has fast charge, but to miss the micro sd is just plain daft. If only the Redmi Note 5 had type C.. If it makes you feel better, its a cheaper addiction than swapping cars every 5 minutes!! Haha i know that feeling...i was on holiday ordered a cubot x18+from amazon, got home and sent it back? 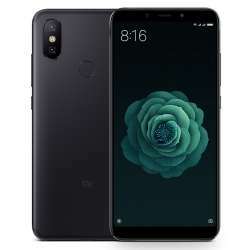 I would recommend the the Redmi Note5 (global version). Sure, might have a Snapdragon 636 instead of a 660 but has micro SD slot. For me the usb C is not a deal breaker. Great phone for the money. If it makes you feel better, its a cheaper addiction than swapping cars …If it makes you feel better, its a cheaper addiction than swapping cars every 5 minutes!! It used to be cars up to about 10 years ago. Lost all internet in cars now and hate driving. High road tax bands stopped me with that addiction lol. Surprised people still want a headphone jack. I've been using bluetooth for years and only use a cable in a dire emergency. Blimey, if there's no micro SD slot then I'd recommend getting a Xiaomi Note 5 64GB for £160.00 odd instead. Flash Lineage OS to get stockish Android. Don't get me started on phone cases lol. I was looking at that phone, software and lack of OIS for the price put me off. Looks to me that the A2 Lite has both headphone jack and SD card slot so have Xiaomi shot themselves in the foot with the A2 full fat version, I wonder? If this had headphone jack,sd card slot and 4000 mAh battery it would sell much better here. Better off with the other xiaomi phones at a cheaper price and install a better OS. Looks to me that the A2 Lite has both headphone jack and SD card slot so …Looks to me that the A2 Lite has both headphone jack and SD card slot so have Xiaomi shot themselves in the foot with the A2 full fat version, I wonder? It does have that ropey notch though. If this had headphone jack,sd card slot and 4000 mAh battery it would sell …If this had headphone jack,sd card slot and 4000 mAh battery it would sell much better here.Better off with the other xiaomi phones at a cheaper price and install a better OS. I was looking at that phone, software and lack of OIS for the price put me …I was looking at that phone, software and lack of OIS for the price put me off. Can't believe they used a micro USB, why didn't they put a type c on it!!? Nah i have a OP5T, the lite version looks much better than this phone tho,never knew there was another version. So final price £204 !!!!!!!! I’ve gone for a Note 5 global after much consideration. Better battery, headphone jack, SD card, more chance of custom ROMs with Lineage on it and it’s a good deal cheaper. I’m not sure the 660 processor would be much better than the 636 for anything other than gaming. I’ve gone for a Note 5 global after much consideration. Better battery, h …I’ve gone for a Note 5 global after much consideration. Better battery, headphone jack, SD card, more chance of custom ROMs with Lineage on it and it’s a good deal cheaper. I’m not sure the 660 processor would be much better than the 636 for anything other than gaming. These Mofi ones give good protection. Errm. You know, USB C is actually an improvement, you 2001 friend. Lol, first time seeing someone sees it as a bad thing.